How is it March already? And how am I writing our second proper house update post already? Eek! I’m not sure where the time has gone. Talking of things that have gone missing this week, my desire to do house related jobs is another thing that’s flown away. Oops. I blame the cold and dark evenings, I’m just not motivated to do anything other than sit on the sofa. Oops! Despite this lack of motivation we have made some progress this week, so let’s dive into the house update. 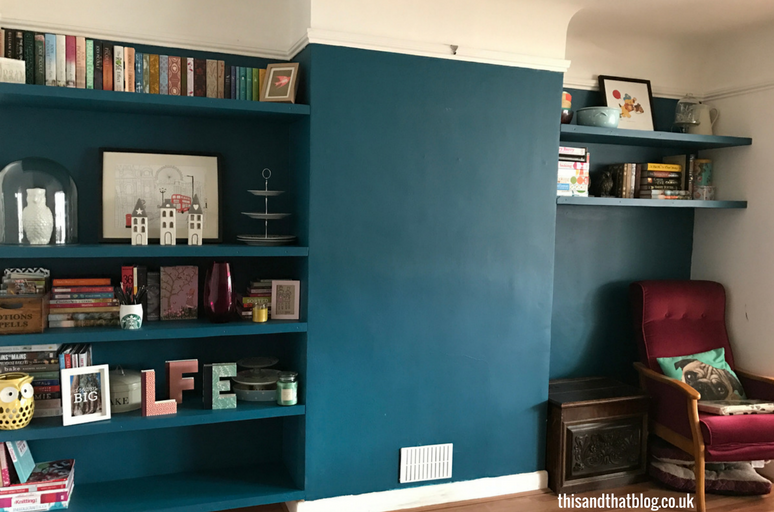 House Update: What’s been ticked off the list? The major thing that’s happened this month is that we’ve got three alcoves full of shelves, which are beautiful. I think this is the house update that has made me the most excited! I’m obsessed with how good these shelves look. Shout out to our genius carpenter, Perry, who stayed until 9.30pm on day two to finish them. Anyway after hours spent sanding, priming and painting said shelves we’re now in the exciting stage of shelf faffing. I swear we move things around on a daily basis as we try to get the perfect set up. To be honest it’s actually quite enjoyable! Now that the shelves are done it means that Lau’s room is finished and she’s 100% settled in. Well apart from the aforementioned shelf faffing anyway! No more piles of crap important stuff on the floor and shoes with no home. So that’s quite exciting. We’ll have to get a post written for you asap, with specifics about what she’s done in there. As for other jobs finished and completely ticked off the house update list, well there’s only one other. Oops. But it is an important one. We finally managed to take five boxes of books and other random things to the charity shop. This means our hallway is no longer a dumping ground – this has made a huge difference. So a small, but important job that’s been done. House Update: What jobs have we progressed with? Well in very exciting house update news we’ve removed the horrific fireplace. Yippee! This has been a long time coming and makes such a difference in the living room. Without the stupidly massive fiberglass monstrosity ,that was the fireplace, life is much better. However, we’ve not got much further with it yet. While we had grand plans of getting a plasterer in fairly quickly after it was ripped out, that’s not proven quite so simple. Namely because the fireplace needed to be knocked out more than anticipated and isn’t in quite the state we expected it to be. But we’ll get there. We’ve also made progress on the new kitchen idea after an appointment with Homebase about what we can do. So exciting slash ridiculously scary about all that money. But at least it reinforced what we do want to do in the kitchen and what things we can live with and what must change. 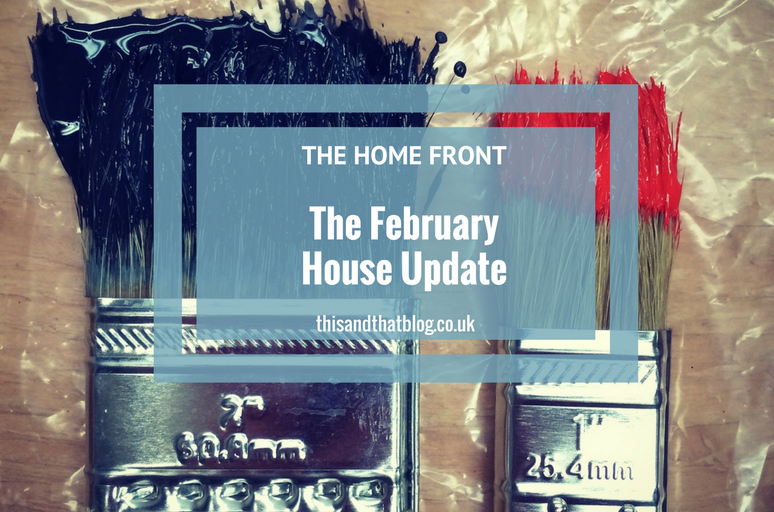 House Update: What’s the plan for March? One of the big projects we expected to tick off the house update list in February was the boarding of the loft. But alas that’s not happened. But it’s in the schedule for next weekend. So all going well by the end of March we’ll have a loft floor and all sorts of storage solutions for it. Then it’ll be all about the organisation as we move loads of winter clothes and random items up there. Here’s hoping we free up loads of space in the rest of the house with this job! I’m also hoping March will see me ticking a few things off the list in my room. Firstly I want to finally order my new bed, then I want to decide if I need to rearrange my room or not and finally put up my pictures. I’ve got quite a few new ones to put up, not least the Minalima prints mentioned recently and the DorkFace ones mentioned over here. But until I know where all the tall furniture is going to live I can’t really put them up. The other thing I’m hoping to finish in March is the bathroom. We simply need to add a few pictures and my ceramic fish collection and we’re sorted. Hopefully this month we’ll actually get round to doing those bits and ticking another job off the house update list! I’m also hoping that the fireplace will get sorted in March, it would be rather lovely to tick that off the house update list. We just need to knock a bit more of the rubble out of the gap, build a box around what’s left and then plaster it all. Then we can paint the walls and be done with that room. Simple, right? So yes, come on March we can do this!